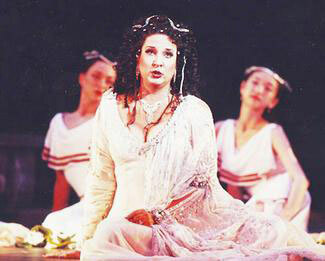 Thomasville native Victoria Livengood sings the role of Dalila in "Samson et Dalila" at the Cleveland Opera. Well, to hear the Thomasville native tell it, plenty. The highly acclaimed mezzo-soprano, who says she has reached somewhat of a crossroads in her career, has put together an ambitious itinerary for the coming year. "I have a ton of debuts coming up, mostly all new repertoire," Livengood says during a telephone interview from New York, where she just finished performing in the Czechoslovakian opera "Rusalka." "I've been known mostly for Carmen," Livengood continues, referring to the young, beautiful gypsy girl in the opera of the same name. "I've done her 250 times, which is a ridiculous number of performances for one role. I like to say she's the one who built my house in Florida. But I've had to reinvent myself into a dramatic mezzo, because my voice has gotten deeper and larger." It's been an improbable journey for Livengood, who grew up singing with her parents, Jerry and Carolyn Livengood, who now live in High Point. But the Livengoods didn't sing classical music - they sang barbershop, with Jerry singing in a barbershop quartet and Carolyn singing with the Sweet Adelines. "My mom tells me I was kicking in the womb to four-part harmony," she says with a chuckle. "My younger brother (Steve) and I were barely talking when we were taught to sing four-part harmony, so we grew up singing, mostly barbershop and gospel. We were known as the Livengood Family Singers." "The only opera I had ever heard was on "Gilligan's Island,' and maybe a pasta commercial or a little on "Bugs Bunny,'" she says. "Literally, that was my exposure to opera." It wasn't until Livengood got to the University of North Carolina - where she had planned to study law - that the East Davidson High School graduate entertained the idea of a career in music. Needing an additional course credit, she tried out for the choir and so impressed the voice faculty that they offered her a scholarship to major in vocal performance. "I was a little untrained - I'd never had a voice lesson - but they said they heard "a diamond in the rough,'" Livengood says. Before long, an instructor was taking her to an Opera Carolina performance of "La Boheme," and Livengood was hooked. "I didn't understand a single word ... but I got chills," she recalls. "I cried. At that moment, I knew that was what I was meant to do with my life." After graduating from UNC, she pursued her master's degree - also on scholarship - at the Boston Conservatory of Music. Livengood, who calls herself "The Dixie Diva," still laughs about arriving in Boston with her distinctly Southern accent. "They probably thought I was some former beauty queen from the South and that I was dumb," she says. "They probably thought I was Elly May Clampett." She wasn't. Elly May never sang well enough to win the Metropolitan Opera National Council Auditions, as Livengood did in 1985 - an honor that launched her career in opera. "I've been working 10 months a year since 1985, traveling and performing all over the world," Livengood says. "It's been a solid whirlwind." Livengood says her career highlight occurred on Oct. 25, 2002 - she still remembers the date - when she sang the title role of "Carmen" at the Met. "That was one of my dreams, and it came true," Livengood says. "I had 250 of my family and friends there, and when Carmen made her entrance, 250 Tarheels burst into screaming applause. The maestro put down his baton - there was that much applause." She's accomplished almost everything she could possibly hope to accomplish in her career - almost. When pressed, though, she admits she'd still like to debut at La Scala in Milan, Italy, one of the world's most famous opera houses. "I'm an American girl through and through, and I believe the Metropolitan Opera is the greatest opera house in the world," Livengood says. "But in the old days, you wanted to sing at La Scala - that's where opera came from, and it's still known as the heart of opera. The public there is so enthusiastic about opera. For an international career to be complete, you need that on your resume." If it doesn't happen, though, Livengood won't complain. "The truth is," she says, "if I had to quit tomorrow, it's been such an amazing ride that I would have no regrets." ©2009 by The High Point Enterprise. All rights reserved.